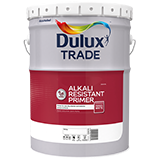 Dulux Trade Alkali Resistant Plaster Primer is a primer for new dry interior and exterior porous surfaces. Primes all types of masonry surfaces such as gypsum plaster, brick, concrete, cement, and all types of composition boarding. Versatile high solids plaster primer. Pigmented white - time saving when top coating. Serves as a sealer and primer.